Summer is the best time of year for rifling through the local library for great, but as yet, personally undiscovered reads. 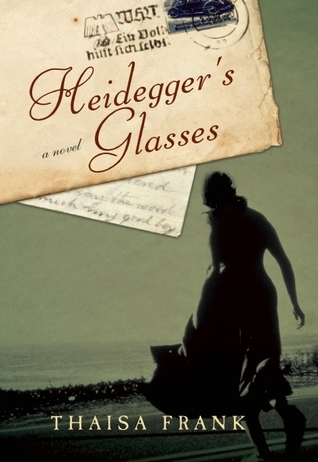 Heidegger’s Glasses by Thaisa Frank has just the sort of cover to grab my attention–rumpled envelope with the Third Reich eagles, faded letter peeking out behind and a shadowed women venturing out across a no man’s land expanse of meadow. Having never been in a war, I don’t know what they’re like, but my impression from reading about World War Two is that is was a lot of violence and a lot of waiting. People were in limbo and waiting for their lives to start again. Heidegger’s Glasses catalogs wonderfully this “falling out of the world” that happens when ordinary things are turned upside down. In this case is it the Nazi regime that is ludicrously obsessed with making things what they are not, an old mine shaft transforms into a street of dreams and letters written to the dead. The writers or “Scribes” barely escaped the gas chambers and wear the fur coats of those who didn’t. These people live lives of waiting for something to happen, for Goebbels to come and shoot them all, or for a miracle to end the war. Only Elie, the leader of this group, seems to understand the urgency at stake as she tries to save one person after another. Heidegger’s Glasses is simultaneously heartwrenching and uplifting. It has the same odd sense of limbo I got while reading another masterpiece about World War Two, Empire of the Sun by J.G. Ballard (this is my all time favorite novel). The characters are stuck in a pretend world that is a quarter what they left behind, a quarter of what’s ahead and the rest a strange dreamland where glasses aren’t glasses but are something on which the entire future of the Nazi regime hangs. Parts of the story seem like something out of Indiana Jones (he always liked fighting Nazis) with a street underground, along with a house and a painted on sky, a man who lives in a “shoebox” and mulls over his crystal balls, a woman who is never quite herself, and letter after letter written to the dead. The philosopher Heidegger, once he appears, is infuriating, a character who shows best just by being himself, that philosophy and other “theoretical” university pursuits have little or no value in a real world where real people who are dying need real answers and real fighters, not someone who will theorize them into their graves. My favorite aspect of the novel is that it shows what a thorough sham the Third Reich became. They were beyond ridiculous in trying to justify their actions and to pretend that they were the least bit civilized. A cell is not a cell, no it’s a waiting room you have to reside in forever. It’s perfectly acceptable to have seances while Russia is beating down our door. There is a certain stupidness about evil that will never allow it to fully triumph. Mostly its stupidness in not knowing that good is where it’s at. Heidegger’s Glasses is a pleasantly paced read that will get you thinking of the merits of philosophy, power, and humanity in general. It shows that sometimes even good people have to fight fire with fire in order to win. It shows just how human we all are, and how helpless we can be when faced with a great political mechanism we cannot control. Snow White and the Huntsman from first-time director Rupert Sanders is brilliant. It’s not perfect by any means, but it’s a rarity in Hollywood these days to have a big budget movie that doesn’t feel like a product. There were no cutesy pop culture references, no trite one-liners with a long pause for the laugh. SWatH is an old yet refreshing story about the universal battle between good and evil. And for a first effort? Awesome. Think what Sanders’ fifth or even tenth film will be like. First things first: The dislikes: I didn’t really care for the dwarves. They did have some catchy funny lines, but I couldn’t really understand what they were saying and blind dwarf playing by Bob Hoskins irked me beyond belief. The shots of him looking almost directly at the camera took me out of the film every single time. Also, I was really bothered that they hadn’t hired actual dwarves or little people for the film. Likes, likes and likes: The cinematography was breathtaking, and I couldn’t help but smile at all of the references to other fantasy films like The Lord of the Rings. The forest could’ve easily been haunted by the spider Shelob, or Gollom or both. Not surprisingly, Charlize Theron outshone the rest of the cast when it came to the acting, but villains usually have the most personality in these sorts of tales. Kristen Stewart did a great job as well, especially with her voice. I don’t know if the accent she used was pitch perfect British, but it sounded natural, which frankly is more important. Chris Hemsworth’s huntsman brought a wonderful gravitas to the production. The actor is twenty-something, but has such a maturity and presence about him that instantly brings integrity to the screen. As the “prince”, Sam Claflin didn’t have much screen time to shine, but he had one or two scenes done really well. The story itself was good, if unfocused at times. I liked the idea of rediscovering a world that maybe you once knew (the enchanted forest), but had long forgotten in dealing with the darkness and brutality of life. Themes: We tend to pull out from films and stories something of what we believe or how we see the world. I’m no different, and as a Christian immediately latched onto the theme of good vs. evil in Snow White and the Huntsman. Snow White whispering The Lord’s Prayer and the beginning seemed at first like a throwaway reference to her “goodness” (i.e., she believes in God or is religious, so she is good) But they expanded on that idea of her goodness by showing the empathy she feels for other people and creatures, signaling that if her goodness comes her faith, it’s a deep faith, something that is part and parcel of herself. Her personality is quiet, calm and sure. She doesn’t panic or babble and her presence is a sanctuary for those around her. This is how I’ve always thought of Jesus Christ, as a sanctuary, and so that’s the symbolism that stuck for me. The stag or hart of the forest that they show about halfway through, is also something that has been used as a symbol or reference to Jesus. So, the stag giving its blessing to Snow, could be like Jesus blessing the Church. In contrast, the queen Ravenna is rough and loud and has no empathy, not even, I think, for herself. She’s merely a wretched creature, much like other iconic villains such as “The Eye” Sauron from LOTR and the serpent-like Voldemort from the HP series. Her life is utterly dysfunctional and she takes absolutely no joy in the world. Her power is oppressive, but not really interesting. This is a person who has no imagination, much like the ultimate prince of darkness, Satan. And for some reason, these super powerful bad guys can’t rule on their own, they always have these lackeys hanging about. Ravenna has a brother who does her bidding. He’s as chained to evil as she is and distinctly lacks purpose. The ultimate love story: Snow White and the Huntsman is an epic love story––it’s just probably not the love story we usually think of. The love story in the film isn’t really between Snow White and the huntsman, but is between Snow White and her kingdom. Magnifying that in a Christian theme: The love story is God and His love for this world. Snow White can symbolize God, the savior Jesus, or, most-fittingly, the believers in Christ, or the Church. The queen then, would be the Devil, Satan, the very powerful, but not powerful enough, ruler of this world. If that is the case, if the love story is actually between Snow White and her kingdom, then it makes perfect sense that the chemistry if any between her and the Huntsman is so subtle. It makes sense that he kisses her dead lips not because of romantic love, but because he had started to hope in something good and pure again and it was taken from him. The Huntsman is searching for spiritual truth. He threw his lot in first with the queen, hoping she could bring back his dead wife. Yes, Satan promises this as well, through witchcraft, spells or other means, but he, like Ravenna, truly has no power in the giving or bringing back of life. All they bring is death always and forever. 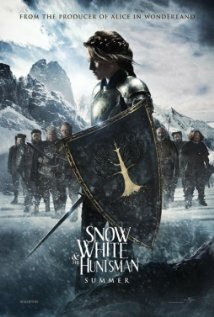 Romance: There is a romance between Snow and the Huntsman, but it is very, very subtle and a touch I absolutely loved. Not every romance is all wittiness, winking and wooing. I think when the Huntsman kissed Snow White, it was a last-ditch effort at having hope. When she rose from the dead that’s when he began to truly love her. I think the moment Snow realized that she loved him was when he made a flirty comment about her chain mail. She didn’t know what to say, I think, because she realized at that moment that true love was dawning on both of them. The ending was perfect: They didn’t need to kiss, they just exchanged a look that seemed to be her declaring her love for the Huntsman, and him accepting that love and pledging loyalty to her. Okay, I’m probably reading too much into it, but I thought it was a beautiful moment and a thought-provoking movie. It is one I definitely want to see again.